Do you want to be your mother’s favorite child this Mother's Day? If so, these heart shaped waffles are the way to go. Impress the entire family and effortlessly dress up your breakfast/brunch table with these love inspiring waffles. There are two settings for pleasing even the pickiest waffle fans. The first produces a waffle with a crisp exterior and a moist interior; while the second creates a more uniform texture. I tried both and had great results. The iron is simple to use and a breeze to clean up. The color control and beeping timer take the guess-work out of when your waffles are ready. And the non-stick surface guarantees you never have to oil the pan after the very first waffle has been made. After trying a bunch of waffle recipes around the web, I found the basic recipe included with the machine to make the best tasting waffles. I used the crisp exterior/moist interior setting, and the waffles were perfect. They had a great texture, and weren't too sweet or soft inside. I preferred the color setting at 5 or 6 but as I mentioned above it's easily adaptable. 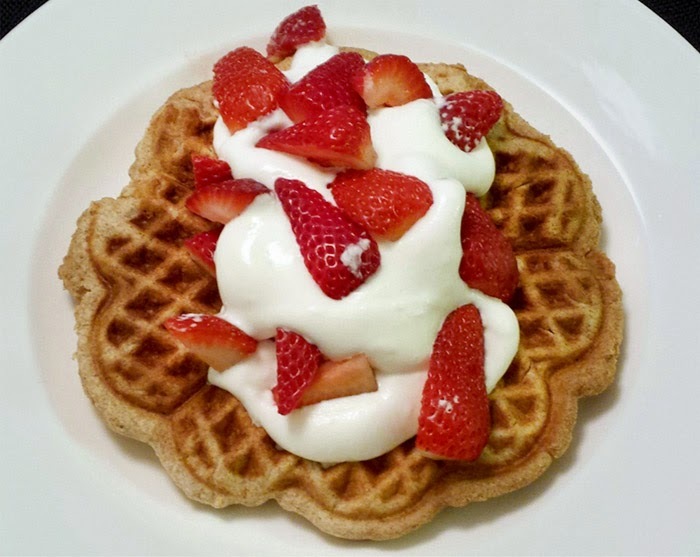 Although they are delicious on their own I spruced up the waffles with some homemade whipped cream and fresh strawberries. A filling breakfast that will sustain you throughout the day these waffles are perfect for Mother's Day or any occasion really. wire whisk until smooth and free from lumps. Batter should be thick but still pour slowly from a ladle or measuring cup. Add more milk as needed to obtain a thick but pourable consistency. If the batter becomes too thin, stir in a teaspoon or two of additional flour. Preheat the WafflePro® at: “Crisp Exterior/Moist Interior” @ Color Control 4 or “Uniform Texture” @ Color Control 31⁄2. If using a different brand maker preheat according to directions. batter. Bake until the signals indicate waffle is done. Remove waffle and place on a wire rack for about 30 seconds. Serve immediately topped with homemade whipped cream and berries of your choice.